It’s become kind of a tradition for me to take a little road trip over the Thanksgiving holiday, and this year was no exception. 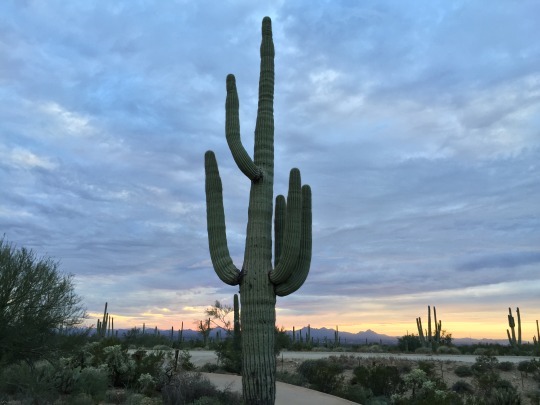 It really was a late decision to go to Tucson, but I wanted to check out someplace new. 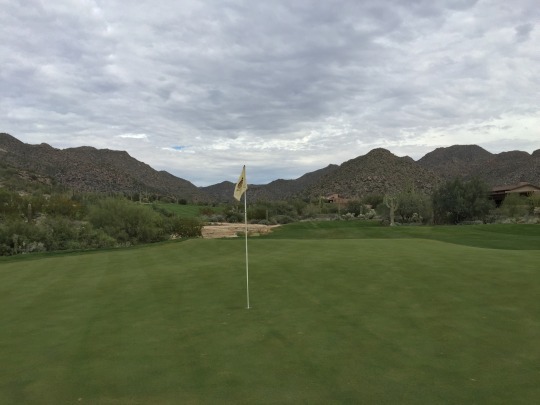 I’ve played a number of courses throughout Phoenix and other parts of Arizona, but this was my first time in the Tucson area. 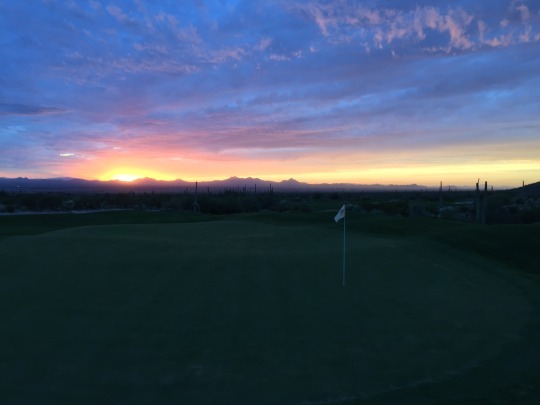 After all, there is a lot of great golf there. 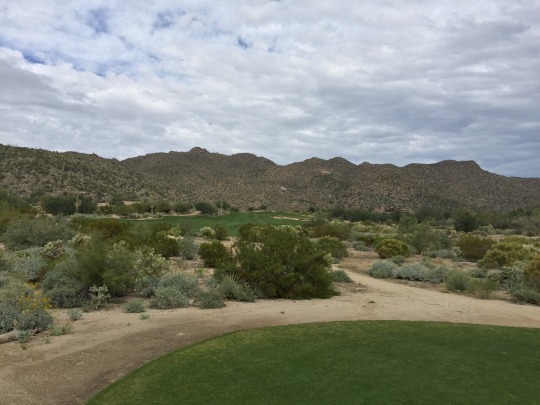 I played six courses over four days in town, so I will break the reviews up into two at a time and post them throughout this week. It was kind of a theme for me this week to play courses that have gone through some name changes and alterations over the years. 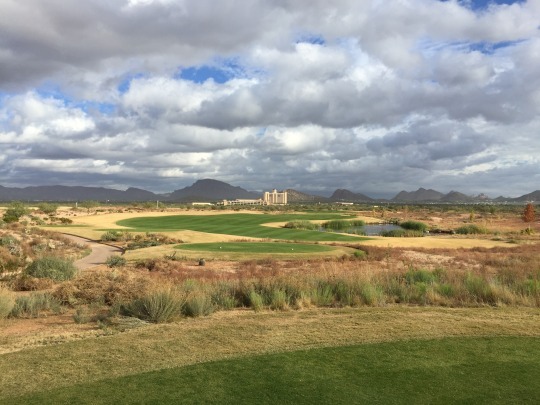 Dove Mountain used to have Ritz-Carlton in the name, but the resort sold the course property. 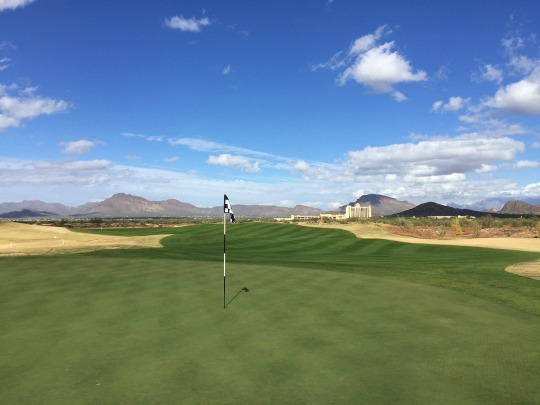 They do still have some stay and play packages and a general relationship as part of the larger Dove Mountain community, but it seems that the move has made the course more public-friendly. By that, I mean you still get some top-shelf golf with a little better pricing. 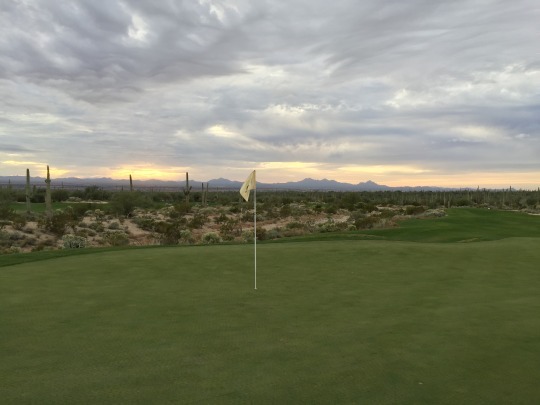 They are more in line with the other high-end resort courses in Tucson now, which is where they belong. 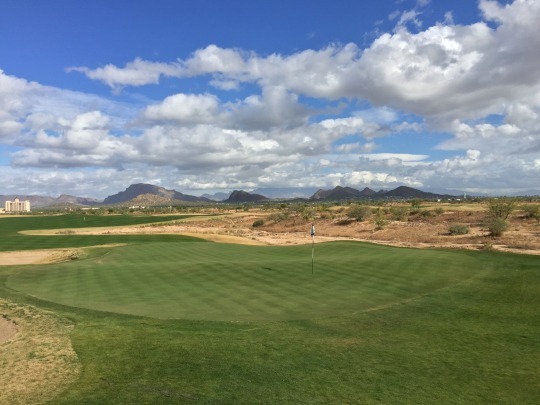 Dove Mountain was able to bill itself as something more special because of its notoriety as home to the WGC Accenture Match Play Championship for several years. Any course where the best pros in the world play naturally demands a bit more attention, and truth be told, that was a big reason it was one of the courses I for sure wanted to play on this trip. 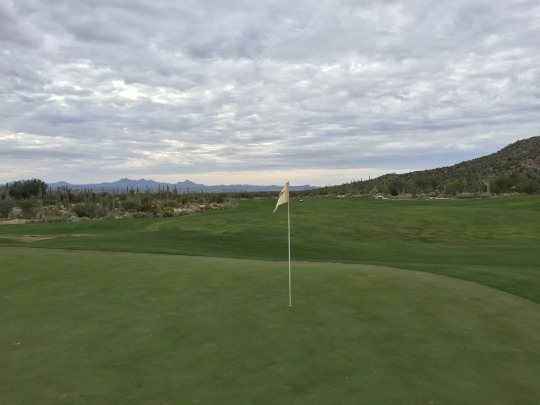 I booked a 12:10 through GolfNow. It was a fantastic $60 “hot deal” rate. 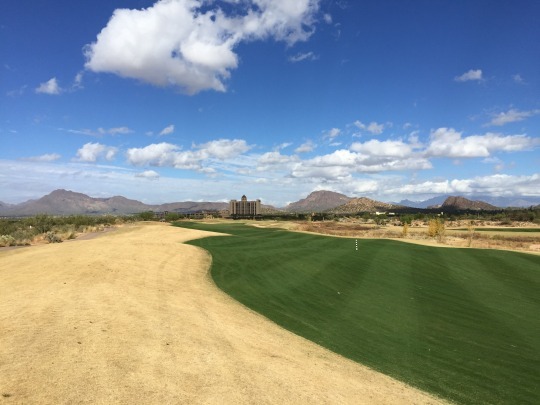 When I saw that available on Wednesday, it was ultimately the deciding factor that made Tucson this year’s Thanksgiving golf destination. I showed up early in the hopes of getting out ahead of my time. They were fairly busy, but were able to slot me in an earlier group going off at 11:20. That turned out to be a huge move because I was then able to play all three nines before it got dark. 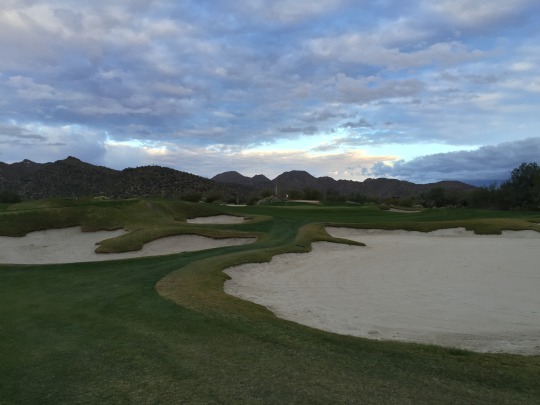 I was paired with a twosome and we played the Wild Burro nine first, followed by Tortolita. 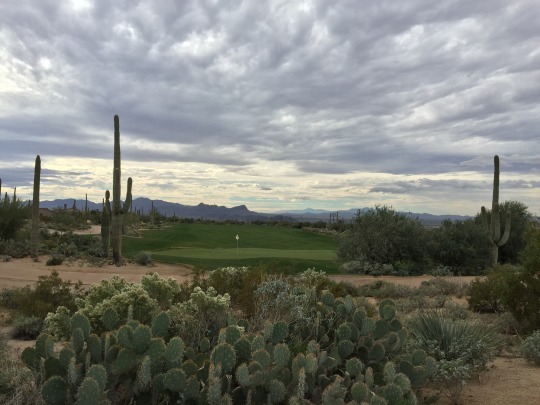 Then, they charged me a $25 replay rate to play Saguaro by myself. The pace was great all the way around. 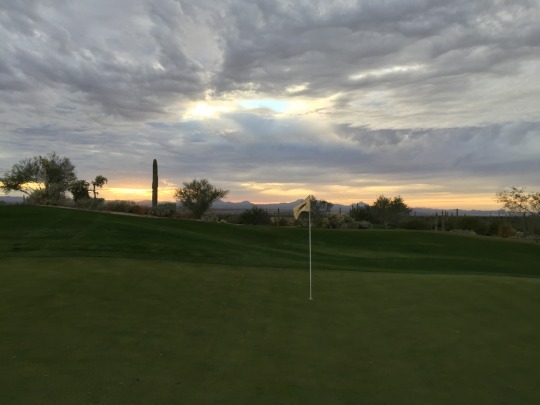 By “busy” at Dove Mountain, that means the tee sheet was full, but the times were spaced out generously so that everyone can enjoy a nice relaxed pace without any issues of the three nines intersecting at the turns. 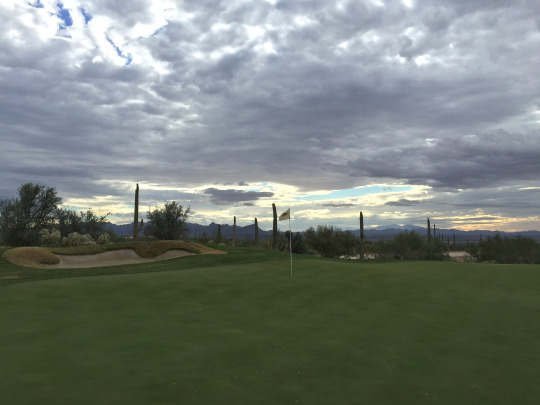 The first thing you notice when you arrive at Dove Mountain is the setting. It is secluded up in the foothills. 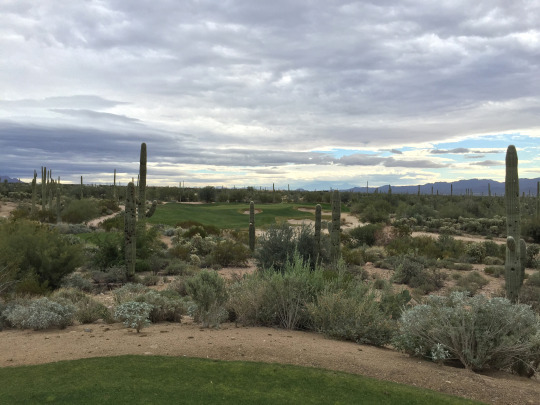 There are some great views of the valley, rugged hills and a ton of saguaros peppering the landscape. There are a few houses scattered throughout the property, but all are nice and never detract from the scenery. 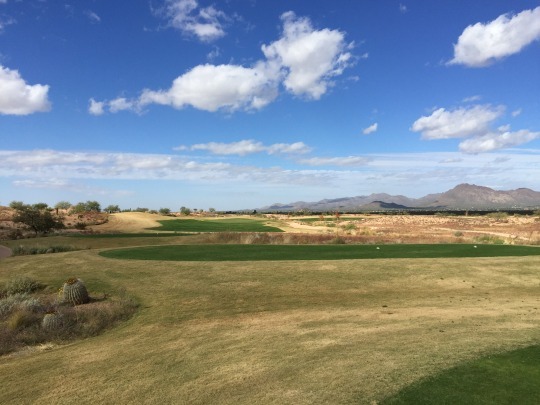 Once you are on the course, you get a fun layout with a lot of diversity from hole to hole. 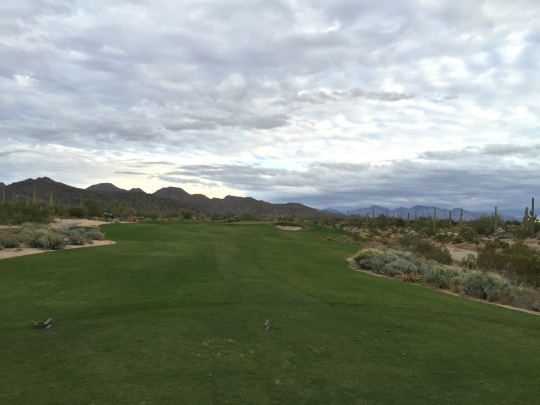 You get generous fairways with lots of bail-out room and a some risk/reward options on certain holes. Then, you get the greens. 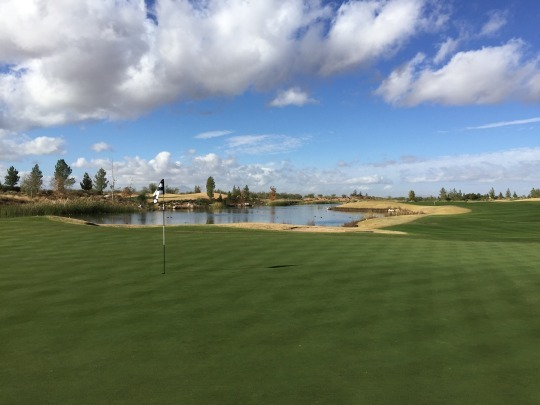 I should note that the course was designed by Jack Nicklaus and his green complexes are usually very challenging. 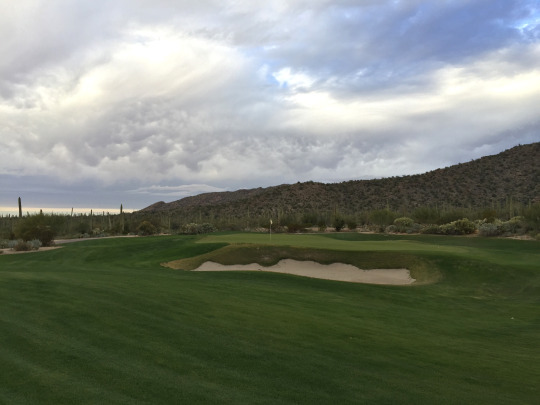 At Dove Mountain, most of the greens are elevated and very well protected by deep bunkers, false edges and collection areas. 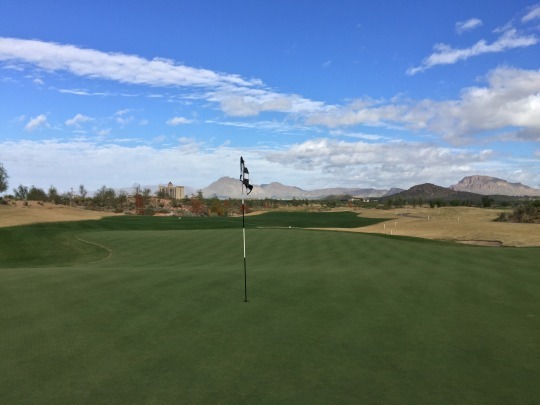 The greens themselves have a lot of severe undulation with all sorts of humps, bumps, ridges and shelves that will boggle your mind. 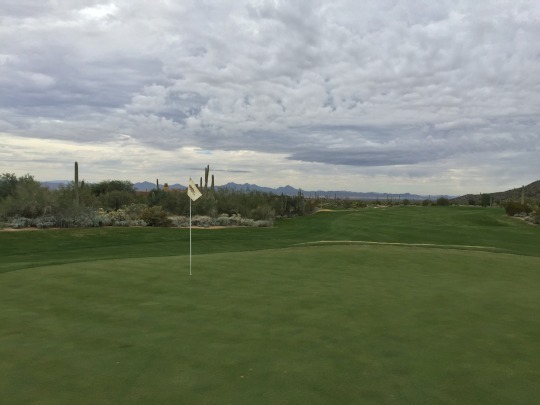 The pros played the Saguaro/Tortolita combination for the tournament, and at some point, those greens were actually “softened” somewhat to appease the masses. That said, they are still very difficult. On the other hand, you have Wild Burro. Since it was not used in the tournament routing, it was left untamed as the name would suggest. 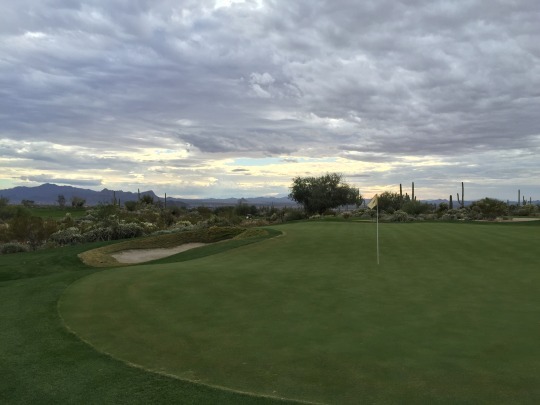 It is truly “wild” with some of the toughest green complexes I’ve ever played. 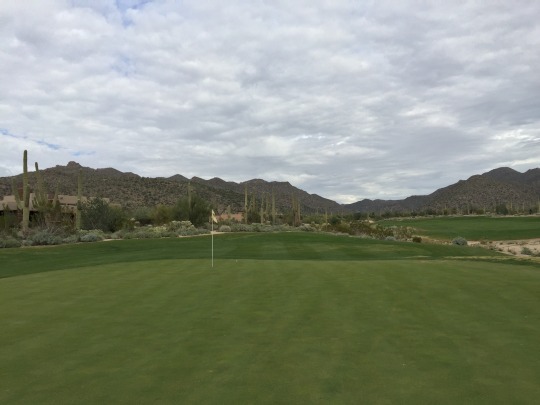 It doesn’t help that I am writing this review several days later than when I played, and I played five other courses after it on this trip, but ultimately I will remember the setting of the course, the facility’s excellent overall presentation and the severity of the greens more than many particular holes. 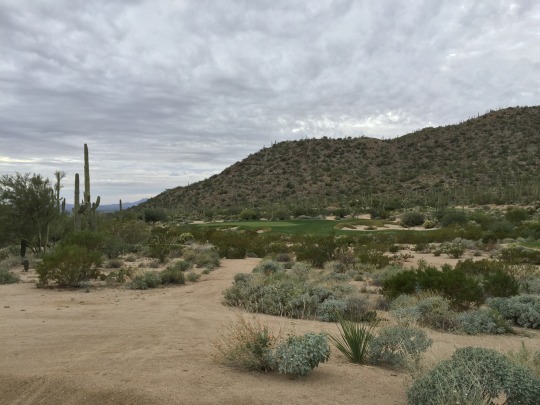 The 3rd hole of Saguaro is definitely the signature par-3 on the property and there are plenty of unique and interesting holes to enjoy. It’s an excellent track no matter which nines you play. 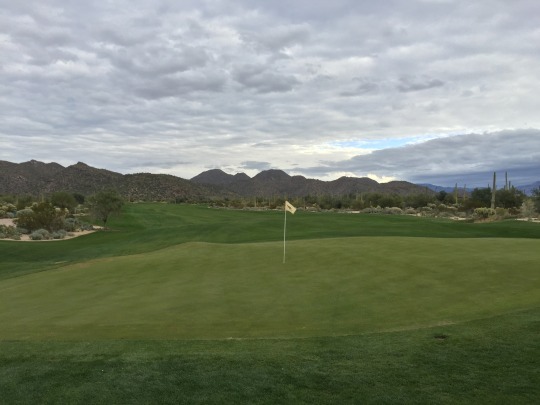 The course was in excellent shape all the way around. 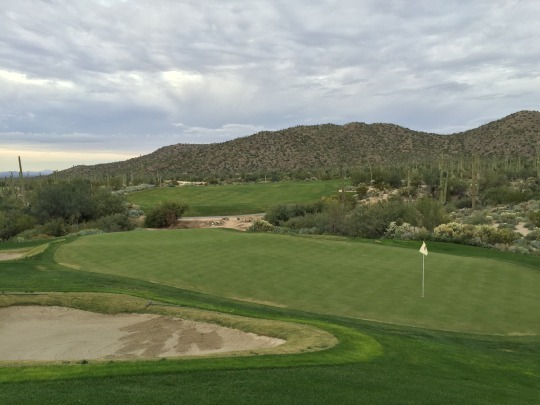 The Saguaro nine was maybe the weakest as it was the last to overseed and aerate. The tee boxes were exceptional. 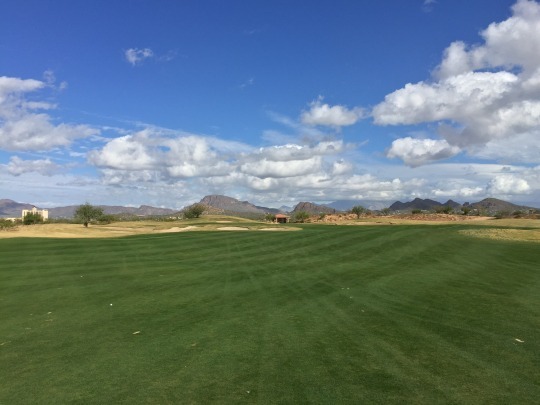 The fairways were very good with just a few thin spots here and there. The rough was lush and green, except for the dormant bermuda rings they leave around the bunkers for that winter look. The bunkers were great. Some greens looked a little beat up and showed some maintenance, but they generally ran smooth. They were receptive and rolling at medium/quick speeds. 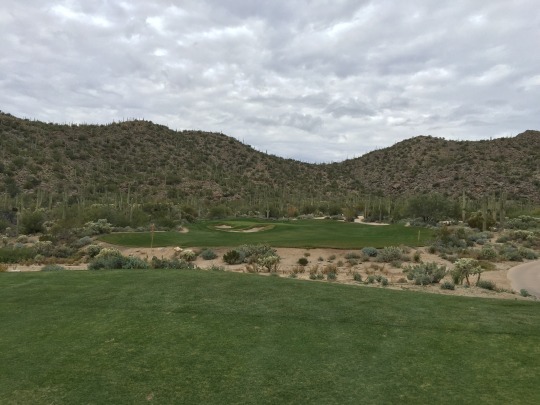 Because of the slopes and undulations, you definitely want to be below the hole any time you can. 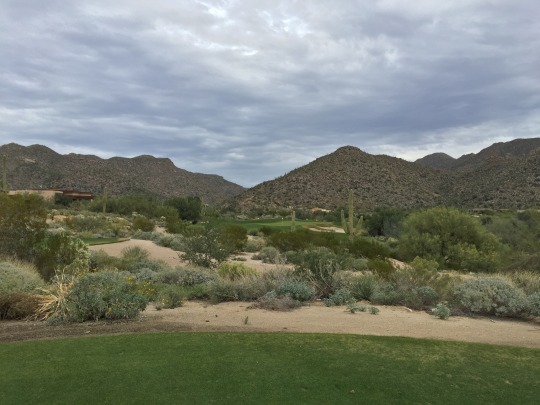 Dove Mountain was a great course to start the trip with and it measured up to my lofty expectations, perhaps even exceeding them. For the reasonable price I got (especially getting to play all 27 holes with a decent replay deal), it was well worth it. 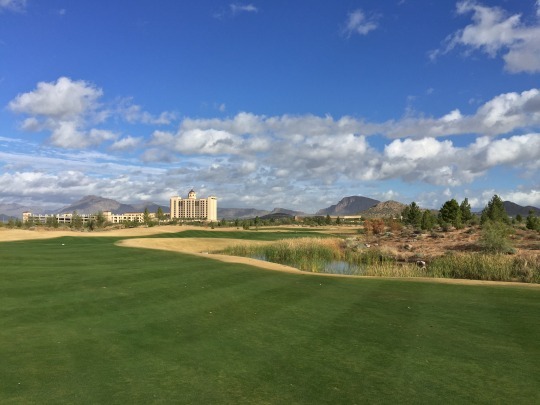 Even though it’s no longer part of the Ritz-Carlton resort, you can still except excellent quality all the way around and a great golf experience on a really fun course. 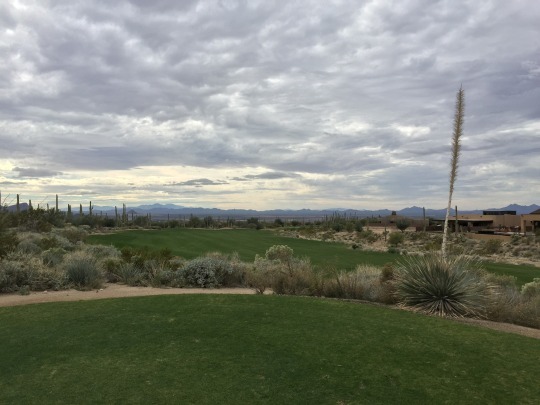 Unfortunately, it was rather cloudy throughout the round, so my pictures probably don’t show the true beauty of the course. Those clouds were worth it in the end, though, because they helped create one of the most beautiful sunsets I have ever seen. That was sure a really nice way to finish the day here. 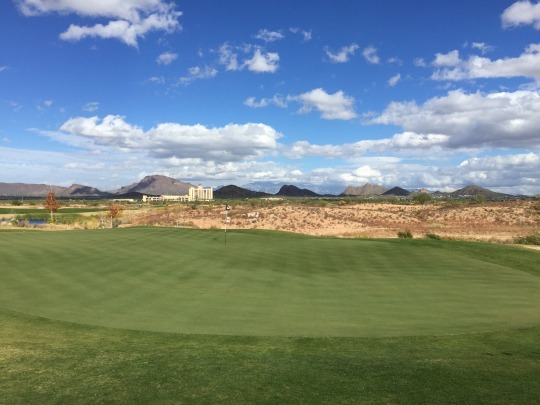 This is another course that was high on my list to check out while in Tucson. 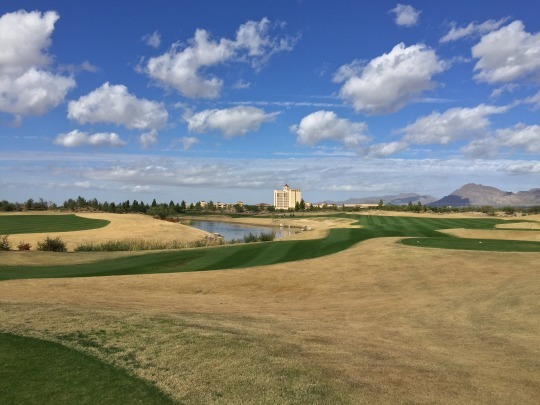 It’s not one with that much notoriety because it’s one of the newer courses in town, but it sure looked appealing to me. I was intrigued by the fact it was designed by Notah Begay III (along with Ty Butler). 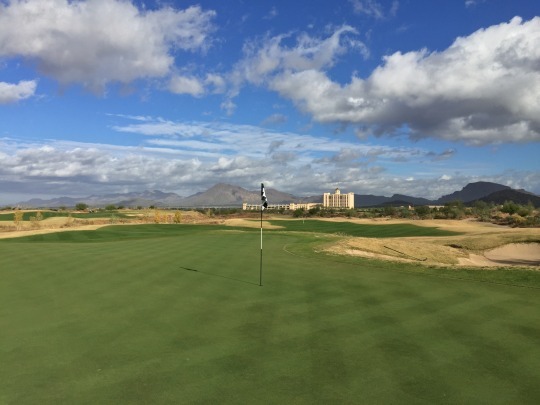 The course is part of the Casino Del Sol Resort, which is tribal-owned, so it’s cool they hired the PGA Tour’s first full-blooded Native American player to co-design the championship course. 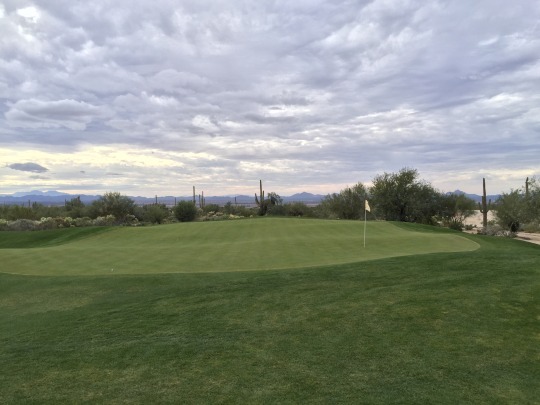 What’s also interesting is that Sewailo is currently the home course for the University of Arizona golf teams. 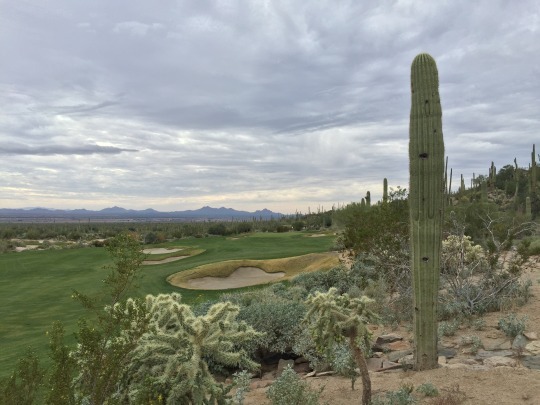 In a way, I find it funny that the U of A course was designed by one of Pac-12 rival Stanford’s most notable golf alums. 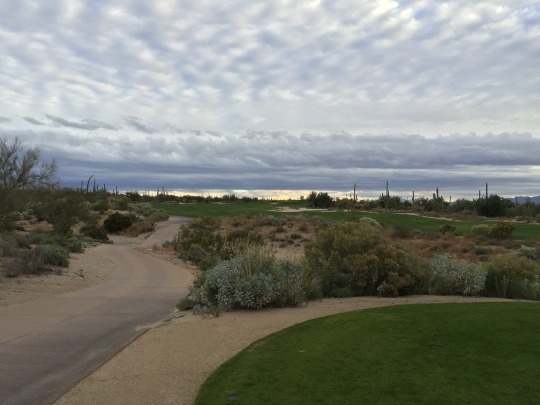 Anyway, the Thanksgiving Day outing was a shotgun start at 9:00 and it was a relatively small group. I think they had us spread out over eight holes of the back nine. I was paired with a really fun group of guys and we had a blast out there. We started on the 14th hole, which is about as far away from the clubhouse as you can get. One of the guys in my group rented a GolfBoard, which made me extremely jealous until it ran out of juice when we were on our second-to-last hole. He had to abandon it there and hop on the cart with his buddy for a ride back in. The pace was good and we finished in a little over four hours. 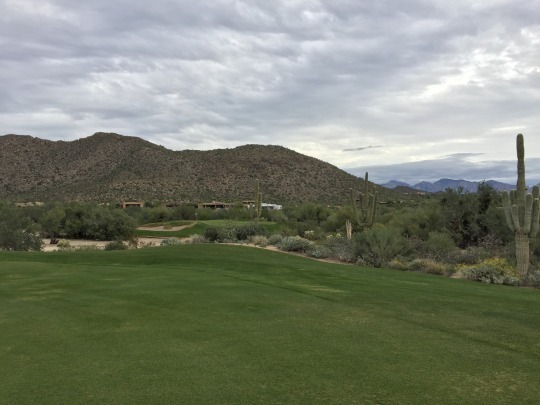 It allowed me plenty of time to head up the road to Starr Pass Golf Club for a second round, but I’ll review that in my next post. 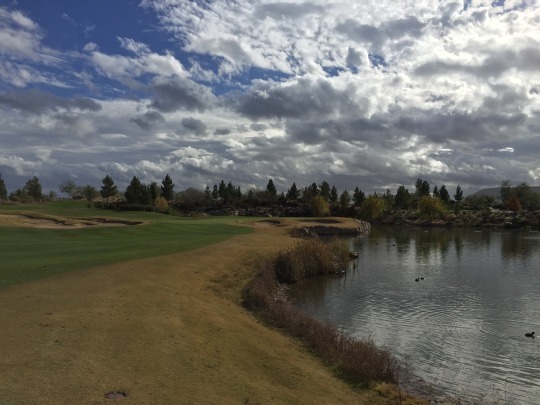 In many ways, Sewailo reminded me of one of my favorite Northern California courses, Sevillano Links in Corning (designed by John Daly). Sewailo is kind of a modern links style with some extreme design choices. 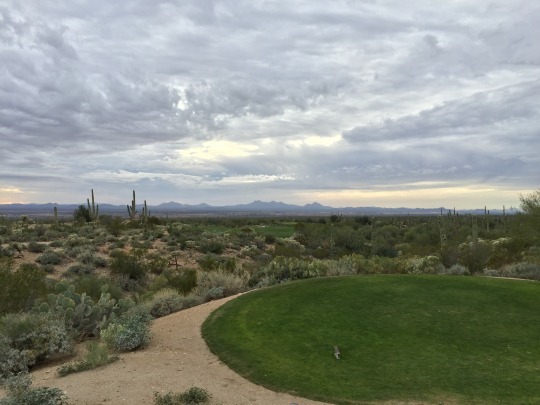 The overall property is relatively flat with just a gentle grade that goes from north to south. 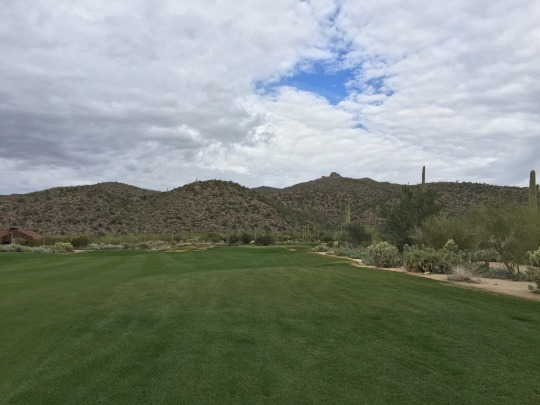 Most holes are either slightly uphill or slightly downhill, but there’s nothing too severe in terms of the changes in elevation. 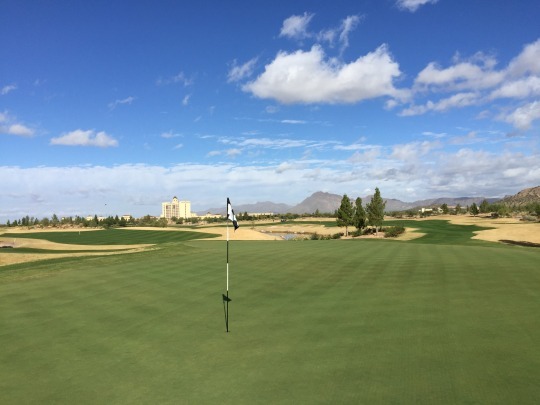 Like Sevillano, Sewailo is a course where strategy is key. 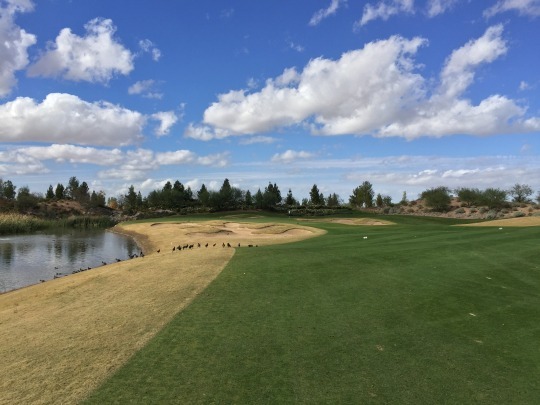 There are numerous ways you can attack a lot of the holes here. 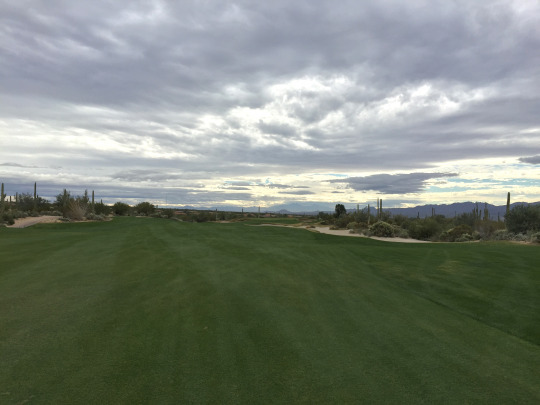 There are some severe doglegs, tricky hazards to avoid and fairways that go from very wide to extremely narrow without much transition. 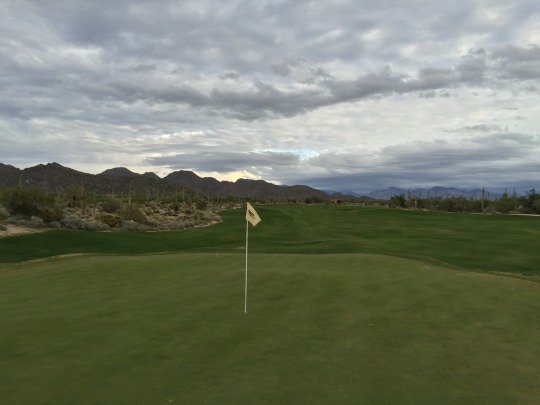 It is certainly a course you’d want to play several times to figure out what’s best for you on each hole. Longer hitters can play as aggressively or as conservatively as they want. There are generally very safe lay-up areas and bail-out spots. Then, there are many risk/reward shots to consider if you want to bite off more with a driver. However, many of those are somewhat blind shots, so you have to have faith and execute good swings to take advantage of these opportunities. Though very nicely designed, Sewailo may not present as interesting as it really is at first glance. I guarantee the photos will not do it justice. 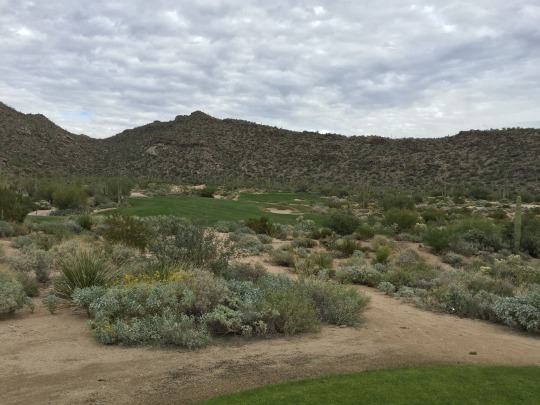 Because it’s often hard to see all the nooks and crannies of each hole, you don’t get the full impression of the different risk/reward options until you are standing there and thinking about your shots. I sure wish I was a longer hitter so I could have tried a few more things. I had to stay conservative, but still had many good scoring opportunities. Another interesting aspect of Sewailo is that the holes tend to be on the long side or the short side. 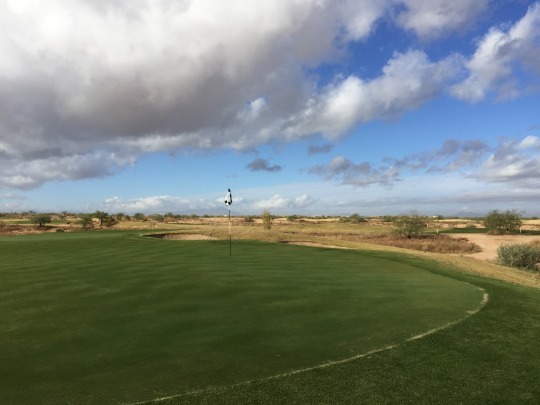 By that, I mean there are several rather short par-4s that you might consider going for, but then there are some long beasts that will take everything you got to get on the green. 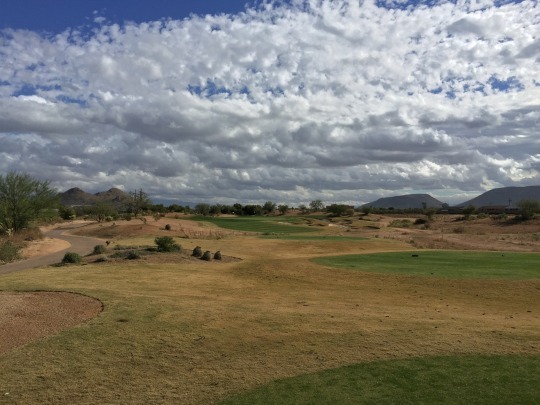 There aren’t many “in-between” distance holes. Sewailo offers a nice selection of tees to suit everyone’s abilities. The tips stretch out to 7,283 yards. Our group played the Ruby/Jade combo, which was plenty for me at 6,512. I think the 18th hole is the signature hole here and it’s unique in the fact that it’s a very short par-4 unless you play the tips. It’s 390 from back there. From the Ruby tees, it’s just 306 yards. 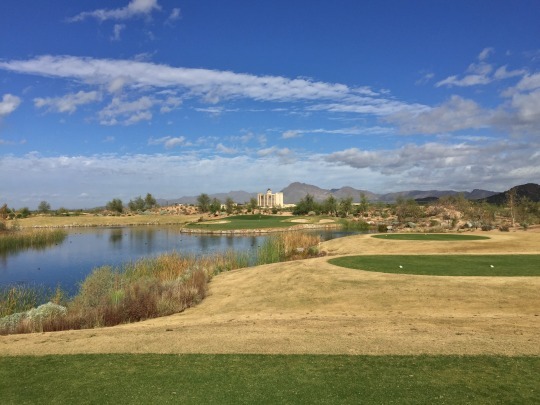 Water runs the entire length of the hole along the right and the landing area feels very narrow while standing on the tee and planning a lay-up. There’s more room than you think, but that water sure is staring you down and everything slopes a bit that way, too. You can consider driving the green, but there is very little room for error. 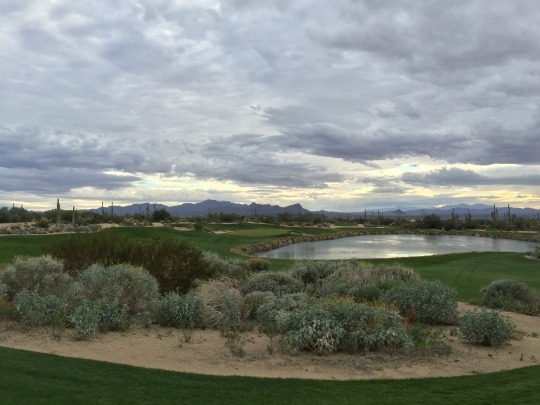 I would love to watch a college match here because of all the risk/reward options available throughout the course. It has to produce some exciting matches because of how it’s set up. 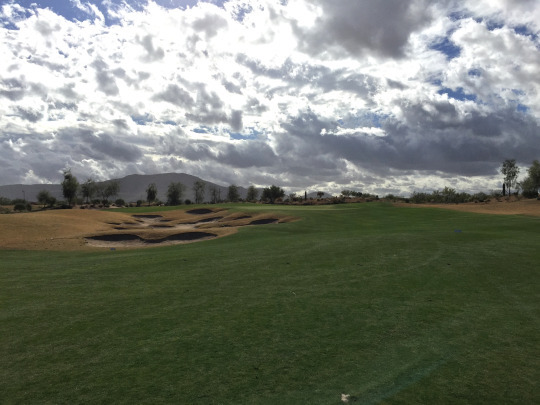 The course was in very nice shape all around. 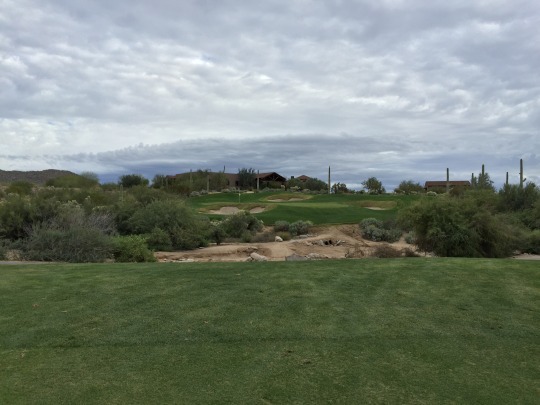 The tee boxes were excellent and the fairways were lush with a good overseed. 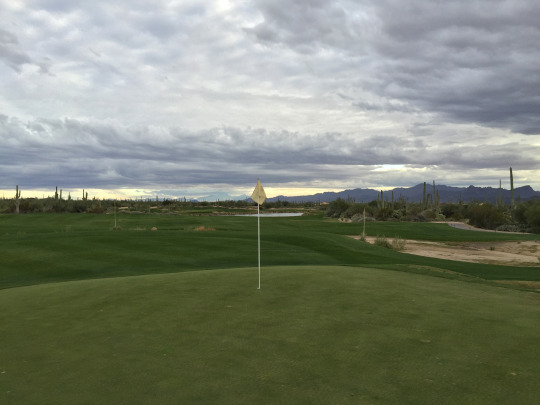 The rough is left tight and dormant bermuda in the winter for that cool gold contrast around the dark green fairways. The lines and contours were very clean throughout the course. The bunkers had very soft beach sand. 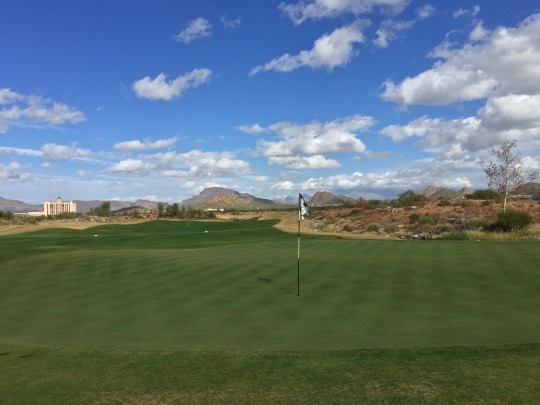 The greens were great. They rolled at medium speeds and were very true/smooth. 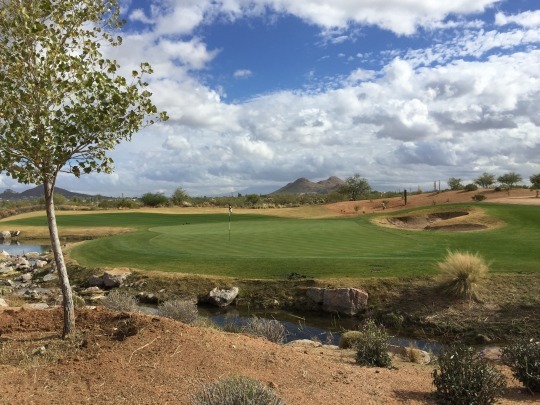 Based on what I played this week, Sewailo belongs in the conversation with Tucson’s best courses. 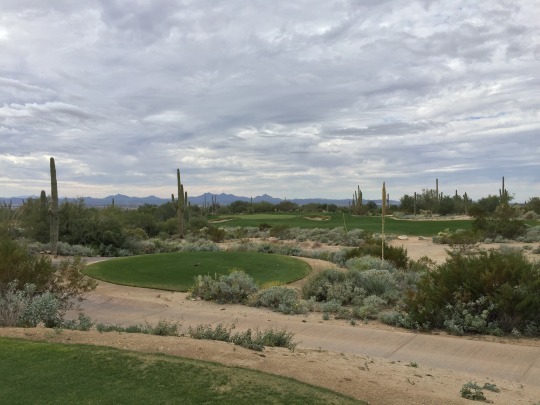 It doesn’t quite have the spectacular views and scenery as the courses up in the mountains, but the layout offers something different and dramatic in its own way. I would easily recommend it.